Attached are comments by EWTN News Anchor Raymond Arroyo on the Pope’s visit to the U.S. for use in stories analyzing the impact of the Pope’s visit. God bless! 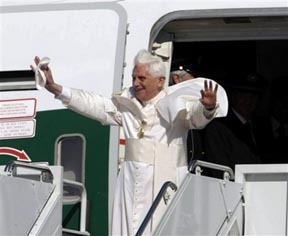 “Journalists are now calling inquiring about whether the Pope's trip was successful and what impact it has had. I stand by two sentences I wrote weeks ago,” said EWTN News Anchor Raymond Arroyo “’The measure of this trip’s success will not be found so much in what the Pope does, as in the echo that remains after he does it. The response of those who hear him will tell the tale.’” This papal visit will play out in big and small ways, in the hearts and minds of those who have heard Benedict's call. "From a purely external perspective (the media perspective if you will), the trip has been a triumph,” Arroyo continued. “Pope Benedict's ‘theatre of substantive acts’: his meeting with victims of clerical sexual abuse; the visit with religious leaders at the John Paul II Cultural Center; his warm, ‘impromptu’ stop at the Park East Synagogue in New York, and the solemn prayer service at Ground Zero all brilliantly revealed a man of faith willing to engage the world with hope and love. “Since the Pope quoted a Byzantine Emperor’s belief that Islam was an ‘evil and inhumane’ religion in Regensburg, there have been concerns in some quarters as to whether this was an appropriate way to engage Muslims in a meaningful conversation,” said EWTN Anchor Raymond Arroyo. “Whatever those concerns might have been, it seems the Pope has been vindicated. “As a direct result of the Regensburg speech, 138 Muslim scholars wrote to the Pope requesting a dialogue with Christians. Now a permanent Catholic/Muslim forum has been established which will hold its first formal meeting at the Vatican this coming November. Saudi King Abdullah, the custodian of the Muslim shrines in Mecca and Medina, has joined Benedict’s call for an interfaith dialogue and is supporting his efforts. There are suddenly negotiations underway to erect a Catholic church in Saudi Arabia and one has already sprung up in Qatar. This is astounding progress,” Arroyo continued.